A lot of league wide hot stove debates included the potential World Series fortune of these two franchises. Their stories are very different. On one hand, there is the Renegades where every single player and coach has grown up in the Renegade system. A team with a former MVP on both sides of the ball (Guy Zuccarello and Christian Thaxton) One of the all time top home-grown programs with a team that seems to improve every year. A team who only played on the East Coast this year where the league always underestimates the level of ball in this region. On the other hand is the Indy Edge, a new team name, but not many new players. Lots of aging veteran players from Indy trying to get a ring. They surround them-self with one of the most under rated pitchers in the game, a kid who grew up with the sport in Kyle Kennedy. They also recruit from all over the country with players from New Jersey, Florida, Arizona, California and Kansas representing this team. The Edge have three players who have won rings for other teams. They have former MVP’s on both sides of the ball, who won them playing for other teams. The Edge have a hall of fame roster made up of some of the all time greats of the game. The Edge also had a rookie who was burning things up on both sides of the ball. These teams were built very differently. The Edge were pounding their opponents all week. They were 12 running many of their opponents. They slaughtered Cleveland 14-2, Seattle 12-0 and the Comets 21-7. All of those games were won in a mercy rule fashion. They also beat St Louis 21-13 on the first day of round robin. Many expected the Renegades to be their first test. Few gave the Renegades a chance. The combined scores of the Edge games were 69-22. The combined Renegade scores were 32-7. After playing on a slow field vs BCS, Boston needed to prepare for a faster track. The Renegade hope involved the management of injuries to Sanchez, Thaxton and Buizon. Were they healthy enough to make a difference in this match. Boston won the coin toss and was confident in its strategy. It knew where Indy was going to attack. It just needed to stop them. Lupe Perez (former MVP for Austin) struck out to start things off. Justen Proctor stopped rookie Sensation, Nick Mulherin. Mark Morris got the team on the board with a run of his own. Proctor would close the inning stopping Danny Foppiano (rings with Kansas and West Coast). A great start for Boston. Back in the lineup and more confident was Thaxton whom-lofted the first pitch he saw into the air for a run. With one out, Rob Dias crushed a ball into left for the 2nd Gade run. That brought David Sanchez up who was pinch-hitting for Guy Zuccarello in the first inning. Sanchez launched a bomb into deep left to show why he is one of the most exciting 2018 Rookies. The score was 3-1 Boston. The second inning was not kind to the Renegade defense. Tobey Gregory who owned the Renegades while playing for the Thunder in the 2016 title game scored to lead off the inning. With one out, stopped by Rob Dias, Lupe Perez came to the plate. Drama would soon ensue. 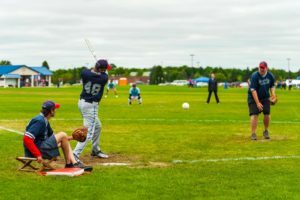 Every year since 2015, there is a call that goes against the Renegades. In 2014, Against Bayou City there was a huge debate on the legality of re-entering Seth Clark into the game. The scorekeeper could not tell us when Clark left the game and we had marked down on our sheets that he was ineligible to return for a few outs. Despite the fact we had it documented and the scorekeeper did not, he was allowed to enter illegally, and scored. The Renegades lost this game by a few runs. In 2015, Colorado entered a player into the game illegally and when Coach Weissman called them on it, there was no penalty. Colorado won that game by one run. In 2016, Weissman’s issues with Colorado continued in the semi-final game. On this play, Larry Haile scored a run and Colorado complained. At the start of the inning, Weissman told the scorekeeper Haile would pinch hit. the scorekeeper confirmed this knowledge. After the run scored Weissman was told he had not followed the right protocol. The run was taken off the board after a long debate. Boston won that game by one run in extra innings. In 2017, against Colorado, the umpire called Joe McCormick out of the batters box as soon as he made contact killing a Renegade Rally. boston lost that game 4-2. Boston had not faced Colorado in 2018, but the Drama would be vs the Edge. Lupe Perez lofted a bomb down the third base line that landed about 150 feet down the line and one foot foul. The umpire called a fair ball. Ron Cochran was convinced the umpire did not know the rule and challenged Weissman to ask. Coach Rob approached the ump and asked if the ball had landed in fair or foul territory. The answer given was the ball landed in foul territory, but it passed the bag in fair territory. An argument was just beginning as the Renegade defensive players all took a knee. The ump was defiant that he knew the rules and that was a fair ball. Boston protested on the spot verbally but nobody collected the money. Cochran went to the rule book with the umpire and the two conferred for a few minutes. After a conference, Cochran walked past Weissman and stated, “the ump read the rule book to me, and the rule says its fair. I don’t believe it…but i don’t have my reading glasses.” He sauntered back to the bench. Weissman went to the rule book and asked where the rule was and started to read it as play resumed. As Mulherin was swinging the bat, Weissman found the rule was read incorrectly. Mulherin scored and the argument continued. Weissman underlined a key word that said “NOT” to the umpire who had missed that word. He had made the wrong call. It was a foul ball. Boston was adamant this needed to be corrected and stated they had protested it before. It was not the Edge’s turn to gripe. Another play had occurred after the one in question and this was what the Edge argued. They did not want to turn back the play despite acknowledging the umpire made a mistake. The Edge additionally complained about how the “rules” of handling a protest were not followed because the money was not collected at the time of the initial protest. A call was made to the head umpire. Play was stalled for nearly 15 minutes. The edge knew the rule, they knew the umpire ruled incorrectly and they were willing to protest the game if the game was rolled back to that point in time. The head umpire tried to reason and look for sportsmanship. No compliance from the Edge. Boston would be screwed for the 5th year in a row on a bad call where everyone on the field knew the wrong thing happened. The umpire felt awful and even stated he did not want this pressure and would not ump again. No volunteer should ever be put into that situation. This was the travesty of the situation. The Edge lack of sportsmanship and thirst for rings was clearly shown here. Weissman was heard saying, he was done being a nice guy for future games. The team works too hard to get screwed like this every year. The Edge would score three more times in this inning and after one and a half , the score was 7-3. In the bottom of the second, Boston showed little quit. Thaxton, Dias and Haile all scored on well struck balls to bring the score back to a one run game. At this time, it felt like that one run awarded on the foul ball would really hurt. The third inning was a nightmare for Boston. Even though the defense knew the ball was going to the left side, they could not stop it. McCormick had 5 chances at balls on defense and came up empty. Buizon had 4 chances and came up empty. Proctor even had a pair and came up empty. Mulherin and Foppiano each plated a pair in the inning to lead the Edge to an 8 run inning. Boston had a whimper for an answer as only Rob Dias would score. It was 15-7. The Edge put the hammer down in the 4th as Foppiano and Morris each plated a pair, leading the Edge to another 8 run inning. Dias and Proctor led the Renegades in failed chances on defense this inning. Larry Haile, Joe McCormick and Joey Buizon also struggled. The 12 run rule would soon be in effect as the score was 23-7. David Sanchez re-entered the game to lead off the 4th for Boston. He came up limping after hitting third base and that was going to be the beginning of the end of his World Series. Proctor and Thaxton were stopped in deep left by the rookie sensation, Nick Mulherin. Boston had been mercy ruled. This was the 4th time the team had been 12-runned since 2014, and the 2nd time against the Edge. Boston would empty the bench and prepare to reload. This loss was not the end of their week. However, this loss would force the team to play three games on this day. The final score was 23-8. It was the 3rd worst loss in run differential in team history behind the 17 runs it lost to the 2008 West Coast Dawgs (which featured Mazareigos, Foppiano and Perez). It was also the third most runs ever allowed by the Renegades behind the 27 runs scored by the Bayou City Heat (which featured Tanner Gers who played a tiny role in this 2018 blow out. For just the 2nd time in our history a team scored 8 or more runs in an inning twice in the game. Bottom line here was the Renegades were not ready. The coaching staff knew where the defense needed to play. The defense could not make plays. The defense struggled to adapt to the speed of this field. The offense was not clicking. Even though there was a huge delay for a bad call, that play had nothing to do with the outcome of this game. Eventually, the Edge would meet their match. Their injuries built up over the week and they would lose to the San Antonio Jets 19-17 to take 4th place. Their rookie sensation would make the league forget about Christian Thaxton. Mulherin would lead the league in 2018 hitting .706 in his rookie year. The home-grown team would have to pick up their heads. 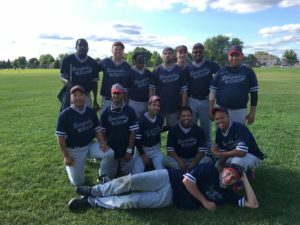 The Minnesota Millers were waiting, and they were hungry to knock off the limping Renegades. Boston packed up the gear and trekked across the soccer complex. Both teams came into this game facing elimination. While Minnesota was working its way through the losers bracket. They had just eliminated the hopes of the East Coast New Jersey Titans. On the other hand, Boston was reeling after getting mauled by the Edge. Boston came into this match with a lifetime 4-0 record vs the Millers, the last time they faced was in 2016. The Renegades came into this game extremely sluggish. Thaxton struck out on 4 pitches and then Rob Dias was put out easily by Evan Van Duyne. Joe McCormick then got things started with a run scoring pop fly up the middle of the field. Larry Haile hit a laser up the middle and Boston was up 2-0. It could have been more if not for a nice play made by Steve Guerra off the bat of Shawn Devenish in deep right field. The Millers got one back in the bottom of the first when speedster, Josh Xiong scored the Millers lone run. Joe McCormick made a play in deep left and Joe Buizon made a play up the middle. This would begin to set the tone. Boston would just start to prove it had more defensive depth beyond their former all-star, Justen Proctor. Boston got some bad news in the 2nd inning when they sent up David Sanchez to hit for the injured Joe Buizon. The plan entering this game was to play a platoon in the 6 hole of the lineup because Buizon was nursing a hamstring injury. Sanchez hit the first pitch but his running looked awful and slow. Weissman wanted to know why he looked slower than his own grandmother. Sanchez was hurt and tried to play through it without being upfront about his injury. Dr. Marciello would soon deem Sanchez to be out for the World Series with a potential back injury. A crushing blow to the team and the Rookie for the Renegades. The next time through the order, Thaxton and Dias would plate runs on well struck balls. Evan Van Duyne would then make his second stop of the inning. Boston would lead 4-1. Van Duyne had 3 stops in 2 innings. For the Millers, Matt McCoy would lead off the second with a run that eluded the right side. Larry Haile would check in with a stop on Chris Peterson at first base. Evan Van Duyne then scored to make it 4-3. Justen Proctor then checked in with his first stop of the game at left shorty and McCormick made his second stop in left field off the bat of Todd Paulson. Through 2 innings, Boston had stops by 4 different players on defense. In the third, Boston would continue to put up crooked numbers. Shawn Devenish scored on a pop up to the right side. Joe Yee would strike out. Thaxton would score on a grounder up the middle. Dias would strike out for the second out. McCormick hit a line drive into left and Haile would strike out. Though Boston plated three runs, it also whiffed three times. The team was getting contributions, but just could not find momentum. Boston led 7-3 but the Millers felt they were in this game. In the bottom of the third, Minnesota continued to pressure the Boston defense. Justen Proctor made his 2nd stop of the game off the bat of Riley Schmitz. Matt McCoy would score another run on the right side of the Boston defense. Joey Buizon stopped Chris Peterson for an out. Lead off hitter, Evan Van Duyne then struck out for the 2nd time in the game, a dagger for the Millers. Boston led 7-4. Shawn Devenish was the sole offensive highlight for the Renegades in the 4th as he plated a run. Guy Zuccarello, Thaxton and Dias all helped Van Duyne become an All Star to end the inning. Evan Van Duyne had 6 stops through 4 innings. Between him and the Renegades having 4 strike outs, the game was going the way the Millers wanted. Boston clung to an 8-4 lead. The momentum was shifting. The Millers caught fire as Josh Xiong, Todd Paulson and Riley Schmitz plated runs to start off the 4th. This time, the defense was able to stop McCoy as Zuccarello was cheating toward the line to make the stop. Proctor stopped pinch hitter, Pat Lemke. This brought the top of the order up. They Delivered. Van Duyne plated a run and then Josh Xiong plated his third run of the game. The Millers led 9-8. Weissman called his team together. He encouraged them to wake up and get their energy level going. Two innings remained and their season was now on the line. They had found energy to come back vs the Titans two weeks earlier. This time, Joe McCormick started things off with a 4 pitch strike out without making contact. The team did not waver or panic. Larry Haile then fouled off 4 pitches before scoring on a line drive up the middle. Shawn Devenish kept up his seeing eye single magic when his hit eluded the Miller right side of the defense again for his third run of the game. Joe Yee then struck out for the second time of the game and the second whiff of the inning. This turned over the order. Good things happened. Thaxton, Dias and McCormick scored as the 1-2-3 punch. Boston had its best inning of the game, plating 5 runs. The score was now 13-8. That call for Farmers insurance was answered. Devenish led off the 6th with another ball to the right side. It would be the first time in his career, he would score 4 runs in a game! After Zuccarello was put out by Van Duyne again, the order turned over. On just 7 pitches, Cochran hooked up Thaxton, Dias and McCormick with their second 1-2-3 scoring inning. That was the nail in the coffin. Boston had 17 runs. In the end, Boston had too much depth. 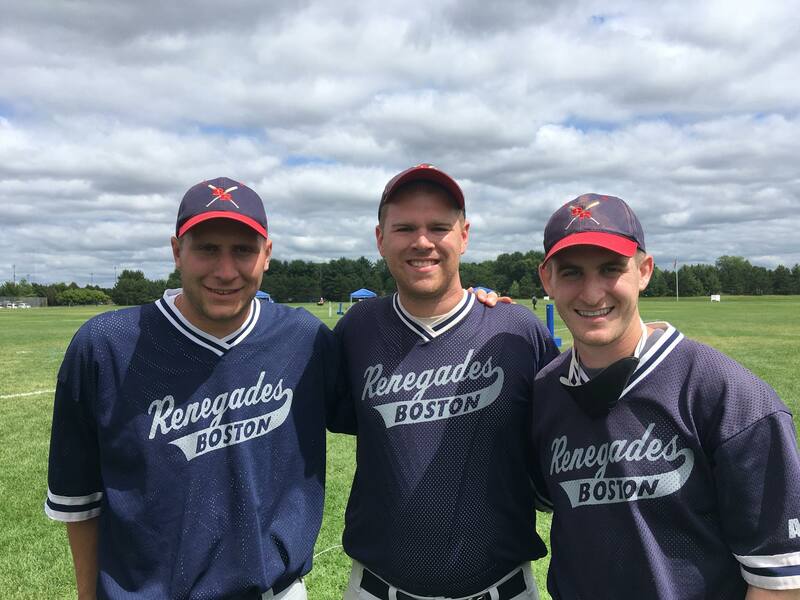 Offensively,the Renegades had scored 17 or more times in a game for just the 14th time in team history. Christian Thaxton, Shawn Devenish and Joe McCormick paced the way with 4 runs each. Five Renegade hitters scored a pair or more! That’s a great contribution! Defensively, six different players made stops. Proctor would pace the team with six. however, Rob Dias, Joe McCormick and Joe Buizon all had a pair of stops as well. Comparing this to the millers, Evan Van Duyne had 7 stops but the rest of his team had just 3. It was not enough. Even though Miller pitcher, Dan Elliason pitched his heart out, only striking out 4…the Boston defense was too good. Boston made 14 defensive stops in a six inning game for just the 17th time! The Millers were eliminated and sent to the 9-12 bracket. Boston would then get a surprise as they soon learned the Tyler Tigers had upset the Chicago Comets. 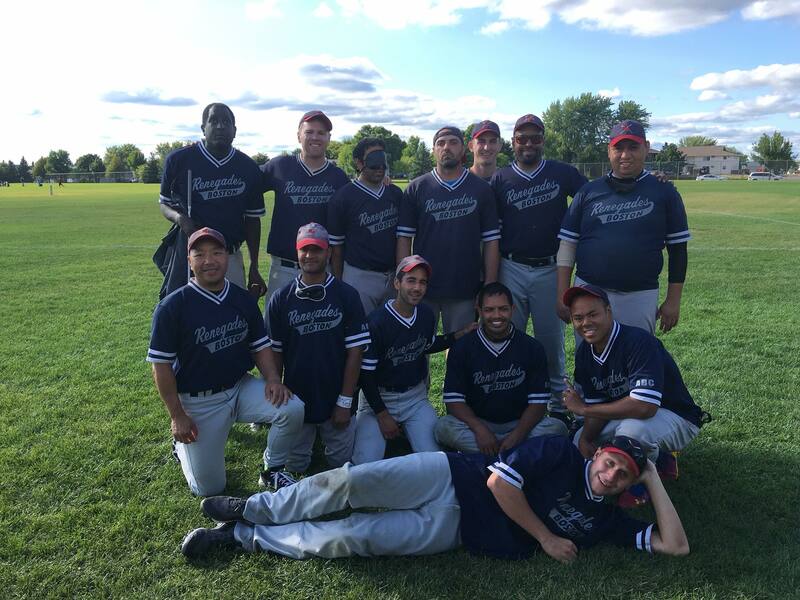 Total Team effort vs Tyler 11 players on the team scored at least one run! There was a lot of noise in the adjacent field as the Tyler Tigers upset the Chicago Comets. Tyler was assured their best ever World Series finish. In a weird and awful schedule move…Boston, Tyler and Chicago were forced to move fields, despite Boston being the highest seed. During this time, Coach Weissman grabbed his mentor, JT Herzog and asked what had happened and what to expect. The mentor shared some info with the mentee and the Gades were off to play Tyler for the first time since 2015. A Team they had not lost to since 2003. Weissman kept saying he felt like a student taking a test without a lot of preparation, as this Tyler team did not have a lot of history against the renegades. Boston owned a 7-1 lifetime record vs the Tigers. In the second with one out, Weissman went to the bench to hit for Buizon and brought in Joe Yee. Yee who was in the midst of his best season ever did not have a ton of success off Cochran. He had been hitting against his cousin, Peter Connolly who had departed the team the day before. In this at-bat, Cochran and Yee were in synch with a line drive up the gut of the Tigers defense. This Tiger defense was set up to take away the lines. That strategy worked against the Comets, but would soon be an issue against Boston. Soon is the key word, but at this time, Boston limped into the bottom of the second with a 2-1 lead. The bottom of the second started off with a nice stop at third base by Shawn Devenish who was gaining confidence in his defense. Julius Artis struck out. Lead off hitter, Ron Jordan (who was later honored for homering in 2017) struck out for the 2nd time of the game and the inning ended in a whimper. Boston was aching to explode. The party started when McCormick scored on a grounder up the middle. The L-Train hammered a line drive into left for his first run of the game. After a Devenish strike out (in which he hit Cochran with a bouncer that resulted in a “no pitch”). Guy Zuccarello got his first at bat in the rotational 6 spot as Yee and Buizon were unable to hit. He hit the first pitch up the middle by Larry Reed for the 3rd run of the frame. Thaxton then scored on a pop fly down the 3rd base line and beat it out. Rob Dias joined the fun with a line drive by everyone into right field. Joe McCormick then scored his 2nd run of the game with a bomb into left field. When the dust settled, Boston put up 6 runs in the frame and now led 8-1. Tyler had no answer in the bottom of the third as Jason Gainey joined Ron Jordan atop of the order with two whiffs in two attempts. Guy Zuccarello made a play on Larry Reed on a ball hit up the middle taking away a ball similar to the one he scored on in the first when Buizon was manning this position. Derrick Loyd, the tallest player in the league at 6-8 struck out to end things for Tyler. Like sharks sensing blood, the Renegades were ready to pounce on their prey. Joe Smolka stopped both Zuccarello and Thaxton on grounders to the left side. Rob Dias kept his cool and got one by Smolka to begin a rally. McCormick hit a laser into right field. At this time, Weissman chose to re-enter Joe Yee into the game to get some defense on the field and get Haile some rest. Yee grounded a ball up the middle and scored. Shawn Devenish got on the board with a grounder to right field. Zuccarello then played his second run of the inning. Boston had now scored 11 runs in the past two innings and led 13-1. Weissman had a quandary as Christian Thaxton was due up. The game was now at a 12 run differential and if Tyler did not score, the Renegades would not hit for the rest of the game. After playing three games in one day, it would be great to get the team back to the hotel. Unsure of what the team wanted, Weissman looked to the bench for guidance. Both Joe McCormick and Christian Thaxton quickly said….”Get everyone in, now!” Off the bench popped Luis Soto who fouled off 4 straight pitches before striking out. Aqil Sajjad also entered the game on defense. Facing a 12-run deficit, Tyler would bring Carlos Black off the bench and Zuccarello stopped him cold. Julius Artis then got a ball into play to the right side but Joe McCormick, playing at right shorty stopped him. Ron Jordan and Jason Gainey, sitting at the top of the order finally got going helping prevent a 12 run mercy rule. It was 13-3. McCormick then scored his 4th run of the match as he had stayed in the lineup, but moved to Dias’ Right shorty spot in the previous inning. Joe Yee scored on a grounder to the left side for his third run of the contest. Joe Quintanilla came into hit for Devenish. On the third pitch he saw, he tagged a line drive into right and scored his only run of the 2018 World Series. After a Zuccarello strike out, Luis Soto got a second chance to contribute. He hit a grounder up the middle and plated his first 2018 World Series run and the team energy was at an all week high. Aqil Sajjad then scored his second run of the inning. After Rosie Reed stopped Joe McCormick, Joe Yee plated his second run of the inning and 4th run of the game. It would be his first career 4-run game! Boston had plated twenty runs. In team history the Renegades had scored 20 or more in a game for just the 7th time. Tyler was exhausted. You could see it in their body language, on their bench and in their faces. Five of their next six hitter struck out. A team that had just defeated Chicago had nothing in the tank for the Renegades. Tyler was off to the 7/8 seed game, and would eventually take 8th place. That would be their best ever finish in a World Series. For the Renegades, this game would be record-setting. It broke a team record that stood since 2012. This 17 run win differential eclipsed a 16 run differential over a team who played in one tournament from York, PA. For Weissman, he praised his teams selflessness and was so excited to see his starting lineup rally to get their teammates into the game. Seeing Sajjad, Quintanilla, Soto and Sajjad score in that 5th inning was a highlite of the year for sure. The team chemistry makes the Renegades special. everyone pulls for each other.